High-contrast scenes can be the bane of a photographer’s existence. If you expose for the shadows, the highlights turn into supernovas. Expose for the highlights, and the shadows become black pools. Solving the problem used to require special equipment or extensive image editing. But Adobe Photoshop CS2 now makes the process easier. It lets you quickly combine multiple exposures of the same scene—capturing the highlights and the shadows—into a single stunning image. Cameras don’t see the world as we do. Our eyes can pick out the shadow detail of a shaded tree trunk and the subtleties in a bright sky at the same time. A camera can’t. At the root of this discrepancy is something called dynamic range, the ratio of the lightest point in the scene to the darkest. On a bright day, most people can easily see 50,000 subtle variations in tone. A typical 8-bit photo captured by a digital camera picks up a mere 256 variations. You can capture even more tonal information by shooting Raw files. When you get back to your Mac, open the files in Photoshop’s Camera Raw mode; then save the images as 16-bit files. Use these converted files for the Merge To HDR command. Beauty Is in the Details My original image (top) suffers from a limited dynamic range. Because the sky is so bright, the bushes in the foreground become nearly silhouetted. Using Photoshop CS2’s Merge To HDR command, I was able to combine three different exposures into a single image (bottom). 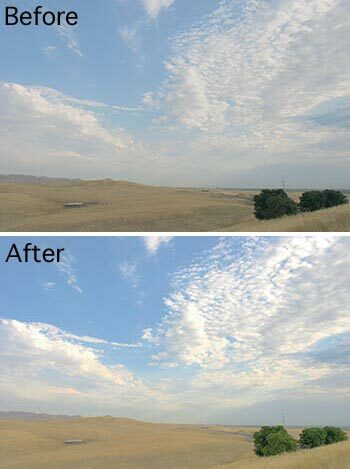 The merged image has much better shadow detail (the bushes) and highlights (the clouds). To compensate for this difference in dynamic range, photographers sometimes shoot through a graduated density filter, a piece of glass that darkens the sky (typically the brightest part of a photo), in hopes of compressing the scene’s tonal values. Graduated density filters work great when you have one bright area, such as a sky, with a clean horizontal line. But they aren’t as helpful in more-complicated scenarios, such as a brightly lit window in the middle of a dark room, or a landscape with a jagged mountain range. In those cases, the better solution is to take multiple shots—for example, exposing one for the window and another for the interior—and then combine the images in Photoshop. Until recently, however, this technique required quite a bit of patience and skill. 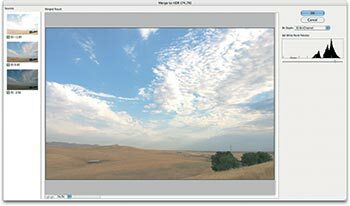 In Photoshop CS2 ($599), Adobe added a Merge To HDR (High Dynamic Range) command that automates the process of combining pictures with different exposures. The result is closer to what you see with your eyes (see screenshot at right). Creating an HDR image begins at the camera. Instead of capturing just one shot of a scene, you’ll need to shoot three or more frames, exposing each shot slightly differently. For best results, use a tripod when shooting, to ensure that each frame is perfectly aligned with the next. This will make it easier for Photoshop to merge the images later. Before you begin, set your camera to shoot at the highest resolution and with the least amount of compression possible. (You want to squeeze every bit of information out of your JPEGs.) Then put your camera in Program mode, compose the scene, and lock the tripod. To capture a simple three-frame series, use the camera’s exposure-compensation control to underexpose the first shot by two stops. For the second shot, set exposure compensation to 0 (zero), which represents your normal exposure. Finally, take the last picture at +2 exposure compensation to overexpose by two stops. You can play with this formula depending on the tonal range of the scene. For example, you may want to bracket only one stop instead of two. Or you may want to take five photos, bracketing from -2 to +2. Upload the pictures to your Mac. Open Photoshop CS2 and go to File: Automate: Merge To HDR. Click on the Browse button and navigate to your bracketed images. If you didn’t use a tripod when shooting, select the Attempt To Automatically Align Source Images option. Then click on OK.
All Together Now The HDR preview screen gives you your first glimpse of the merged photo. After processing the images, Photoshop displays a preview window of your merged image (see screenshot). On the left side of the window, you’ll see your source frames with their exposure values listed beneath them. On the right, there’s a slider that lets you review the image’s entire dynamic range. Why can’t you see all the tones at once? The Merge To HDR command creates a 32-bit image—that’s a lot more color information than your 8-bit monitor can display at one time. The slider lets you view this color information in degrees. However, the slider is for viewing purposes only. You’re not making any changes here. When you click on OK, Photoshop begins creating the merged file. In the HDR Conversion dialog box, you have a choice of four different conversion methods. If you’re relatively new to HDR imaging, I recommend first trying the Equalize Histogram method. It attempts to automatically compress the broad dynamic range of the HDR image in a visually pleasing way. Don’t worry if your picture still appears a bit flat; you’ll have a chance to punch it up later. If you want more control over the conversion process, choose Exposure And Gamma from the Method pull-down menu. This method lets you use two adjustment sliders to fine-tune your picture. The two other methods are Highlight Compression, which focuses on compressing the highlight values in the image, and Local Adaptation, which lets you adjust your image using Toning Curve and Histogram controls. If you’re comfortable setting curves, you might find the last method most useful. When you’re done, click on OK; Photoshop will do additional processing and present you with an untitled 16-bit HDR image. Save it as a Photoshop file. Now you can spruce up your picture with your favorite controls, such as Levels, Hue/Saturation, Curves, and Unsharp Mask. When you’re finished, save the image again, keeping it as a Photoshop file. This becomes your “master print.” If you need to use your image in screen presentations, such as a slide show or a Web page, use the Save As command to create JPEG duplicates. To get a sense of the difference, compare your finished HDR image to the same scene at the normal exposure. In my photos, for example, the HDR image has better highlights in the sky and good shadow detail in the bushes. I might not have bothered to take the picture if the real scene resembled the normal exposure.